Bamboo Fencing Can Be Unique! No More Boring Old Fence! At Bamboo Logistics, we are leaders in the Bamboo Fencing business. We also specialise in water features, statues and even Bali style huts! Bamboo Logistics provides a full landscaping and installation service if you require assistance with your Bamboo Fencing. 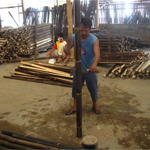 Bamboo Logistics were one of the original importers of Bamboo Fencing and products into Australia. We pride ourselves to provide you service and products second to none. We are a wholly Australian owned and operated company based in South East Queensland. We service all of Australasia and deliver to all states in Australia and New Zealand. We also offer full installation services, including complete landscaping solutions. Working closely with local villages and communities, we have perfected a many high quaility, easy to install and maintain products including the original Black Bamboo fencing panel that is now used in many countries around the world. From the first day that we met Simon we knew that we had come across a gem. We will be using Simon again when we complete the balance of our garden including a new Bali hut. The bamboo fencing enhances our pool area & reminds us of Bali. We are very impressed with Bamboo Logistics! Everyone that has visited our house, since transforming our fence line with your product, has commented on how great it looks! We would like to thank you for your professionalism right from the quote through to the installation. Your products are the best I have encountered and very easy and forgiving to work with from a handy man’s perspective. Your clear and concise direction has assisted me in transforming our entertainment area into an Indonesian paradise. You are a leader in field and we will continue to be a customer of Bamboo Logistics and do our best to spread the word. I would like to thank you for all your help and assistance regarding your Bamboo products. Your knowledge and advice has helped me with my garden designs and the fact you took the time to explain in great detail the correct fixing of the panels along with correct treatment which I find tremendous it brings out the natural look and colour of the Bamboo and I have great comments from my client how great it looks. I cant thank you enough and will recommend you and your products for your ethics and professonable service. ….great communication, reliable,prompt and professional service. In today’s day and age, good customer service is hard to find and Simon from bamboo logistics supplies that with a great product which is solid and well constructed, i am a carpenter by trade and have seen a lot of inferior products that just don’t cut it but Simon’s product and service is defiantly a cut above the rest. thanks Simon for giving me an opportunity to express my gratitude its not often that you have great service and product linked as my dad has always said it takes years to get a good name for yourself but just a minute to lose it with these two things in place (great service and great product) you will always have positive feedback great to do business with you.